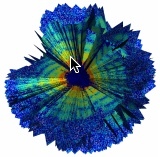 We present a proof-of-concept three-dimensional reconstruction of the giant Mimivirus particle from experimentally measured diffraction patterns from an X-ray free-electron laser. Three-dimensional imaging requires the assembly of many two-dimensional patterns into an internally consistent Fourier volume. Since each particle is randomly oriented when exposed to the X-ray pulse, relative orientations have to be retrieved from the diffraction data alone. We achieve this with a modified version of the expand, maximize and compress (EMC) algorithm and validate our result using new methods.